I am happy to admit that I often bribe my children to come shopping with me. Food shopping is as dull as dishwater for kids and a little treat can often sweeten the deal to sit nicely in the trolley. In the UK the treat my eldest used to ask for was a large, salt topped, soft pretzel- and very good they were too! He asked me to replicate them in my bread baking project and I was more than happy to oblige! If you plan to make these for kids you should also read the children's book Walter the Baker by Eric Carle. Walter is challenged to make bread out of one piece of dough that the sun can shine through three times or he must leave his home, and so the first pretzel was created. 1. Combine the flours, sugar, salt and yeast in a large bowl. Add the water and mix to a soft dough. 3. Knock back the dough and cut into 12 pieces. Roll each piece into a stand measuring 40 cm. Take an end in either hand. Loop one end around, almost into a circle, so that the end just extends beyond the far side of the arc. Repeat with the other end to create the pretzel shape. 4. Repeat with the remaining strands and place on a greased baking sheet. Cover and prove for about 30 minutes. 5. Pre-heat the oven to 200 C/400 F. Beat the egg yolk and water together and brush the top of each pretzel and sprinkle with a little course salt. Bake for 15-20 minutes. Cool on a wire rack. * You can make a sweet version by instead brushing the tops with a little water as they come out of the oven and sprinkle them with a combination of 1/2 tsp cinnamon mixed with 4 tsp sugar. 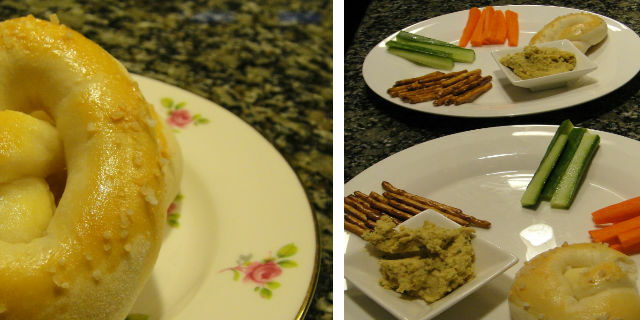 The kids dunked the pretzels into homemade hummus. The pretzels got a huge thumbs up and I plan to make some more very soon for school lunch kits. They are fab- a little bit moreish with all that lovely salt on the top! They certainly were! The kids keep pestering me for more!